As part of 10 Years of Games Asylum, the site’s fine writers are each choosing one game to represent the last decade. Jake is up first. 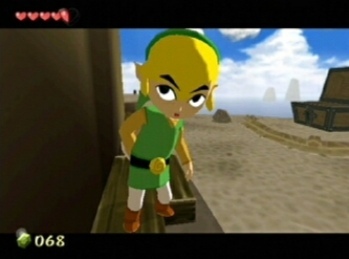 The Legend of Zelda: The Wind Waker was responsible for an unreasonable amount of unrestrained emotion flowing from my brain, through my fingers and keyboard, and onto the web. It’s embarrassing, really. Honestly, embarrassing. The following is from a column, which was intended to be about the dangers of public opinion shaping the development process. It turned out to be a sweary attack on anyone remotely criticising what was then just The Legend of Zelda for the GameCube. Whoa, calm down! Look, I was young, okay? And an idiot, it would seem. I first got my hands on the game a few months after its E3 debut, at a Nintendo event in the blisteringly hot downstairs room of a London bar. Ludicrously high praise to bandy about at such an early stage, of course. But it’s easy to forget just how exciting it was to see a ‘serious’ game, which could quite reasonably have looked ‘serious’, adopt a refreshingly fun art style. I didn’t review the game, but I did take the opportunity to lob some superlatives around not long after release. Almost a criticism there: it’s self-indulgent. But most of the best of Nintendo’s work is hugely self-indulgent, isn’t it? We love them for it. Inevitably, the game was top of the pile when I was called to look back over the games of that year. I think that’s what my boundless enthusiasm for the game stemmed from: it was an alternative to the by-then rapidly accelerating war game bandwagon. Plus it was a very good game. 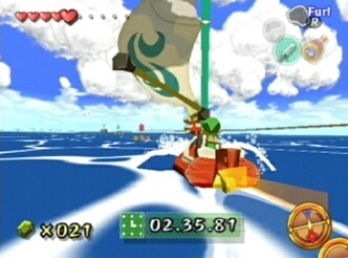 I thought I should revisit The Wind Waker for the purposes of this article. In the hour and a bit I spent with the game, I found myself by turns underwhelmed and delighted. In retrospect it probably wasn’t revolutionary, except perhaps in terms of opening up what can be done visually. But there was a lot of stuff to make me smile: the boy with a massive bogey dangling from his nose chasing Link around; the little noises and faces Link makes. Part of me was tempted to keep playing, but I think sometimes these things are better left in the past, happy memories intact.